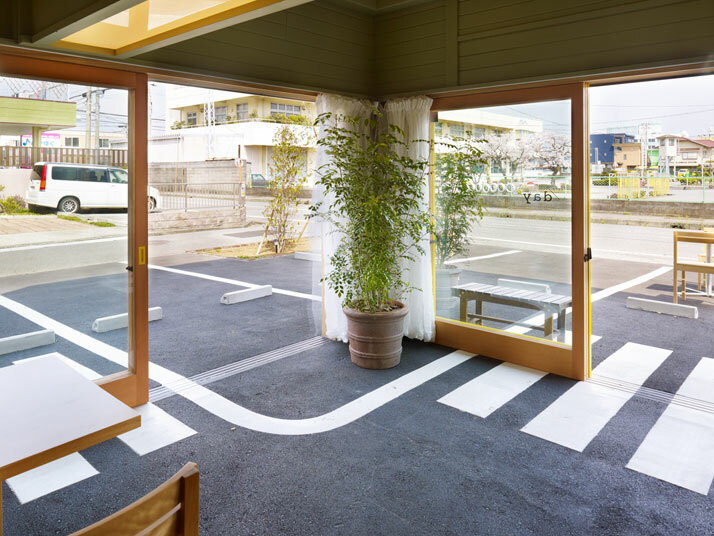 Japanese architectural office Suppose Design Office who we’ve previously seen on Yatzer imbued the Café/day coffee shop in Shizuoka, Japan with a spacious feel mainly by extending road lines and symbols onto the space’s floor, which is made of asphalt whereby the bold white lines on the asphalt denote route directions and zebra crossings. 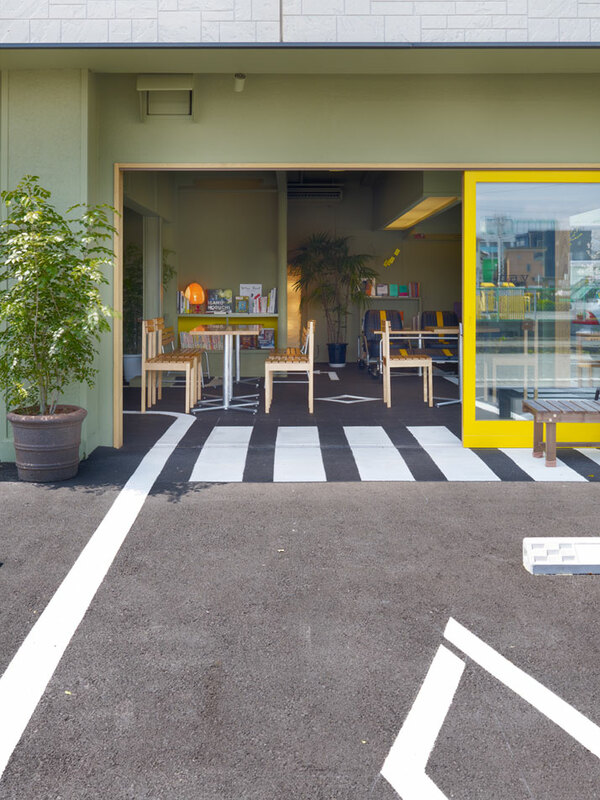 Inspired by the adjacent driving school, Suppose Design Office brings the outside inside, and makes reference to the architectural design from the driving school. 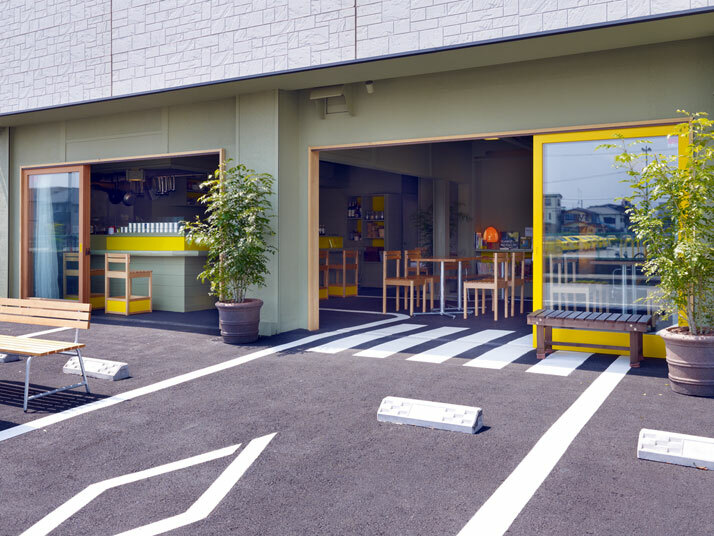 Located within a serene residential area, five-minutes way from the Numazu-shi, Shizuoka train station, the architects were called on to renovate the double unit of an ‘Izakaya’ (a traditional Japanese style bar) located on the ground floor of the two storey building. Right in front of the building the lot was occupied with car parks, a driving school and the zebra crossing; it seemed as if the road continued forever! With a glimpse at the driving school, it seemed as if yellow cars dominated the area, even the poles that configured the driving lane were yellow! 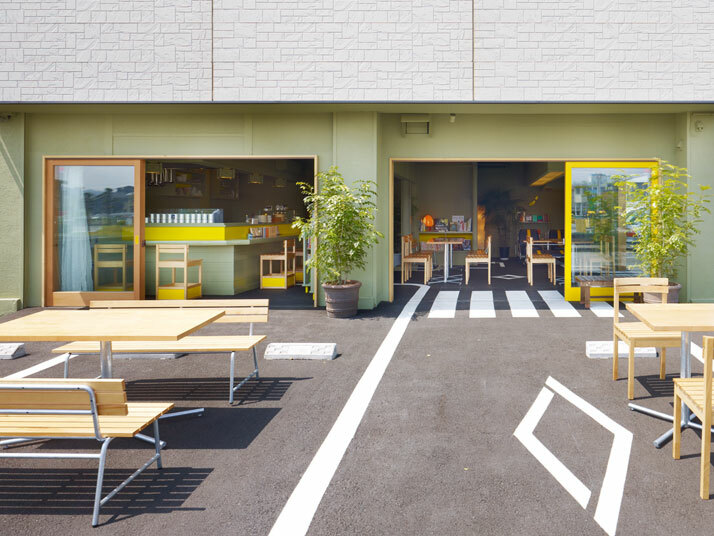 Yellow was everywhere, and indeed proved very influential for Suppose Design Office as this proximate element was the inspiration for the café’s interior design. 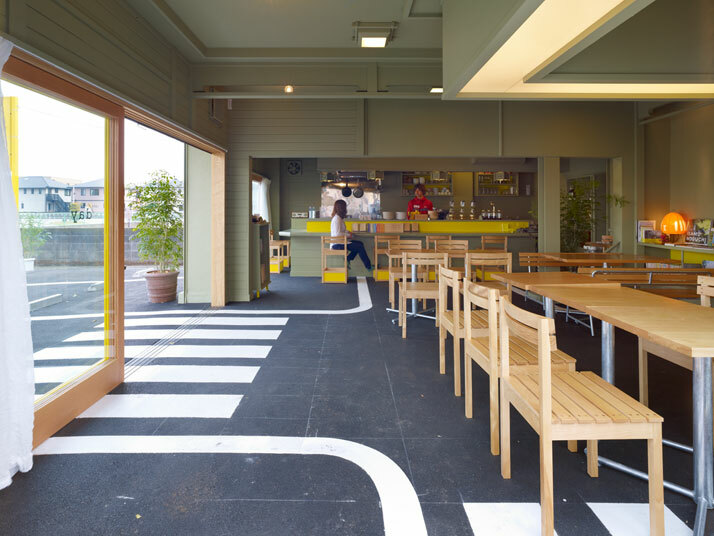 Café/Day’s building shell gives the impression that the structure was frivolously sited upon a pre-existing parking lot, unveiling the bold white lines of the traffic markings and the asphalt. Even the door frames and furniture details were painted in yellow, matching the flagpoles from the driving school that occupies the car park. 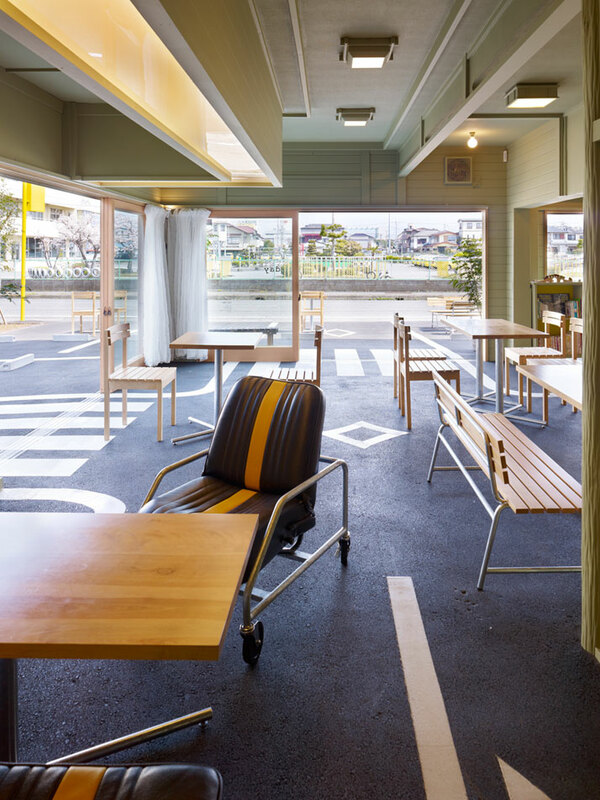 The cafe features benches modelled on bus stop seating and its chairs are made of recycled car seats. With its large glass walls and unusual flooring solution, Café/Day extends this casual relaxing space out into the urban environment. 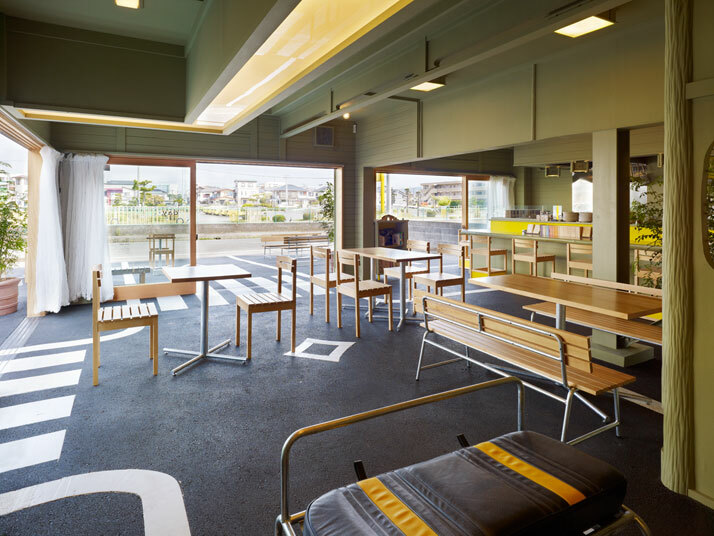 The architectural plan behind the renovation was to merge the two Izakaya spaces into one large open space by demolishing the dividing partition wall, and selectively demolishing parts of the wall to open up the space. 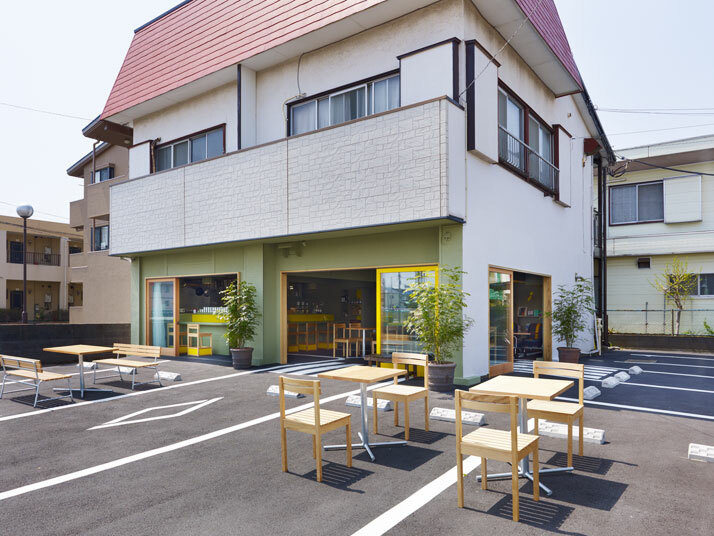 The counter, lighting fixtures and fixed fixtures were maintained and painted in a particular colour so as to erase the ‘signs’ which would betray the former Izakaya space. The only additional material that was added to this renovation was the most obvious material – the asphalt – which was brought into the shop to create an interior space which seems to be the continuation of the exterior space. 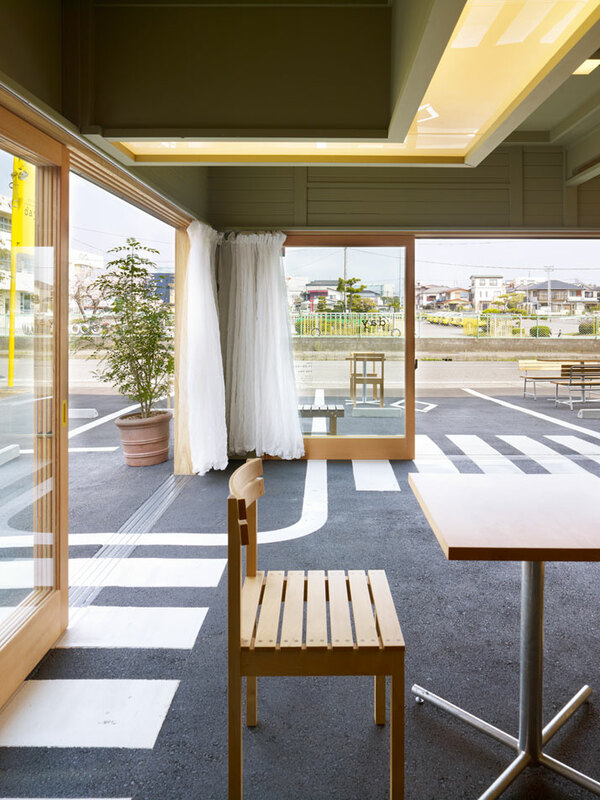 The usage of the same material and the preservation of a single level throughout both the interior and the exterior spaces identify this café as a true open café. Bringing the outside in, and incorporating elements of the outside inside reflects upon the furniture which enhances the concept, as well as the fact that the space cannot be pigeonholed into a particular category. It thereby inherits a function of its own and develops its own name through the activities that place. For instance, a bench was designed to impersonate the function of a bus-stop bench and for the sofa, recycled leather car seats were modified and custom designed to create an original sofa. Meanwhile, the use of yellow reflect elements of the adjoining driving school. 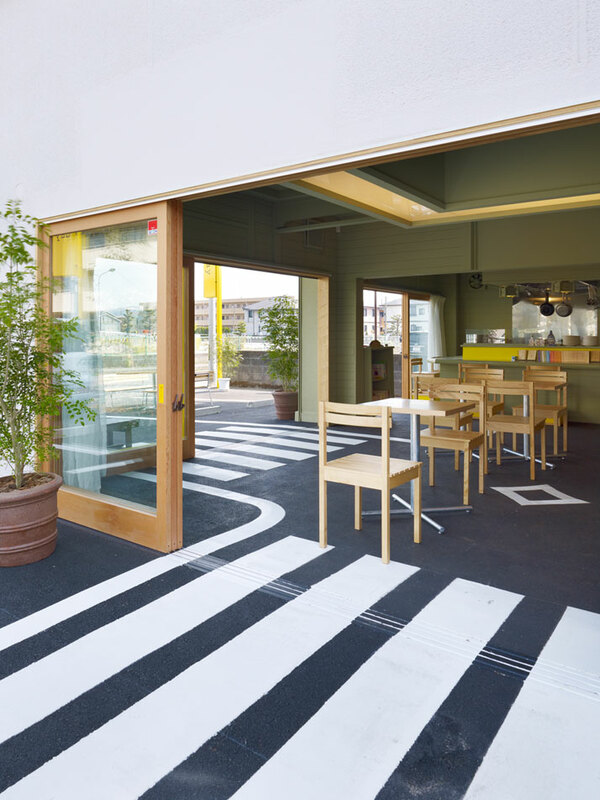 The former Izakaya was easily transformed into the Café/Day without betraying any element from the former program. It has incorporated socializing and gathering over a mug of coffee with a now new bolder effect. The architects used the power of a ‘word’ in a paradoxical manner and found a new approach in the renovation works’ design process of. Suppose Design Office has stated that they would like to start out their design process without giving a particular ‘name’ to the program, but by defining the space through the program.